Social Media Club founders Kristie Wells and Chris Heuer are in Paris covering all things tech at the Le Web conference from December 7-9th. This global conference combines industry thought leaders from the social, mobile and technology spaces … and even fashion! Yes, the fashion world has gone high tech. 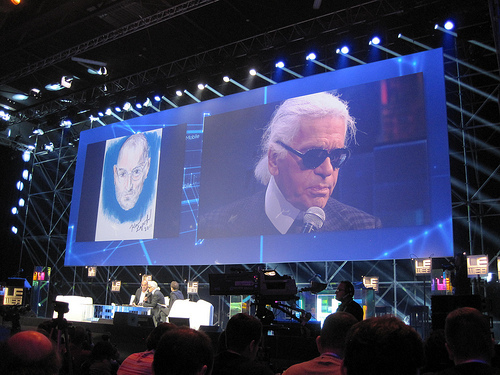 Yesterday, Karl Lagerfeld, a household name in the fashion industry who has worked for such brands as Chanel and Fendi, took to the Le Web stage to share his insights on technology and how he’s integrating it into his every day. Did you know he owns 20-30 iPads which he uses for sketching ideas for upcoming lines, as well as, four iPhones to keep his contacts organized? To say he has embraced technology is a huge understatement, and we find his uses a great example of what can be done (of course…most of us will not have the availability to buy as many devices as he, but we’ll save that for another post). One of the key insights from Karl – like many of us, there is a lack of time to invest heavily into social networks, however, he understands the value in being connected. His thought is “You do not need to be over connected, you need to be well connected.” Basically, you don’t need to be on every service or connect with every one, you should focus on the services that provide you clear value and connect with the people that are important to you personally and professionally. Common sense, but something many of us forget for fear of missing out on something. Thought provoking moment from this eccentric fashion icon. To check out the entire post on Karl Lagerfeld’s presentation and other great resources, visit Social Media Clubhouse blog this week. We are also meeting with entrepreneurs, big thinkers and startups here that will be featured on the Clubhouse blog over the coming weeks. Lots of great information being shared and we are happy to have the opportunity to share it with our community. Back in March, Social Media Club proudly launched an educational initiative called the Social Media Book Club. This program highlights one book per month in which we learn best practices, explore timely case studies, and promote premiere thought leaders in social media. Each month we also feature a complimentary webinar hosting the author and highlighting issues of particular interest to our professional community. With the support of publishing companies like, McGraw-Hill, Wiley and Pearson, along with numerous authors, we have successfully featured nine titles over 2011. Check out all the 2011 titles, along with audio and slides from our Book Club authors. We’ve already secured Book Club titles for January through August 2012, and are looking forward to sharing more great webinars with our community in the new year! As a Social Media Club Professional Membership benefit, we invite Professional members to review an upcoming title. Please email Jessica for details. Want to sponsor one of our upcoming weekly emails? Social Media Club is largest organization of Social Media Professionals, with a subscriber list of 30,000 and global reach of 300,000 members. To find out how your business can leverage our weekly newsletters, please email Kristie at socialmediaclub dot org. Social Media for Education( #SMEDU) chat is hosted on Twitter every Wednesday, 12pm EST AND 9pm EST to meet others passionate about the higher ed space and discuss how to better integrate social media technologies into the classroom, school and our daily lives, along with impacts of tech trends in education space. Weekly chats are hosted by Terry Eberhart and Dr. Thomas Ho and chat topics can be found at Social Media for Education blog along with other EDU related blogs on best practices, case studies and news related to higher education. SMC is co-hosting the Lenovo Bloggers Lounge on January 9th at CES in Las Vegas for the fourth year in a row! Professional members are invited to meet the Lenovo cast of characters, check out the hottest Lenovo products and meet other SMC members from across the globe,apply here!